This past week or two there have been a few events starting. We <3 RP is one, and I was in a round for the Cosmopolitan shopping event. There’s also the Liaison Collaborative opening for their 3rd Birthday anniversary round. So much to do, so much to see. I am pretty much ALL over the place trying to figure out what to work on next so I haven’t even been getting to you the lil notes to let you know! 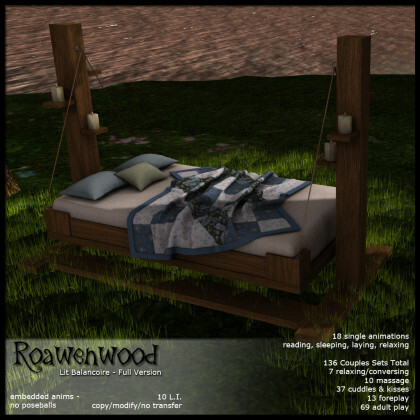 Ok… first things first… I guess I’ll start with the Liaison Collaborative item. I like this. It reminds me of lazy outdoorsy days under the sun with a soft breeze. If you sit back you can breathe in deeply feeling at peace. Well that is the whole premise of this piece. The Lit Balancoire – 10 LI and available in two versions, PG or Adult. Both versions have 18 singles lays, sits and relaxing animations to read or while away the hours watching the clouds. Each version also has a very robust set of menus of cuddles, kisses and ways to spend time with someone. 7 sets for casual conversation or relaxing, 10 massages, and then 37 various cuddles… kisses… and tender moments to share. Now then onto the full version, if you like your options when spending time with someone this set has you covered with 13 different foreplay options and then 69 extra adult animation sets to play around with. So on top of all of the cuddly PG moments you get all of that too so as you can see it is truly a ‘full’ version. There’s also a FREE GIFT for the 3rd Bday round for this one… a set of pictures, so there’s even more incentive to go. I’m quite enamored with this swing to be honest with the candles and the idea of the romantic. I find even the concept of laying quietly watching the trees, the clouds or gazing at the stars as a fiercely calming and soothing moment. And onwards to the next little bits of things I have to show you. I have been in a mood to capitalize on the outdoors things. 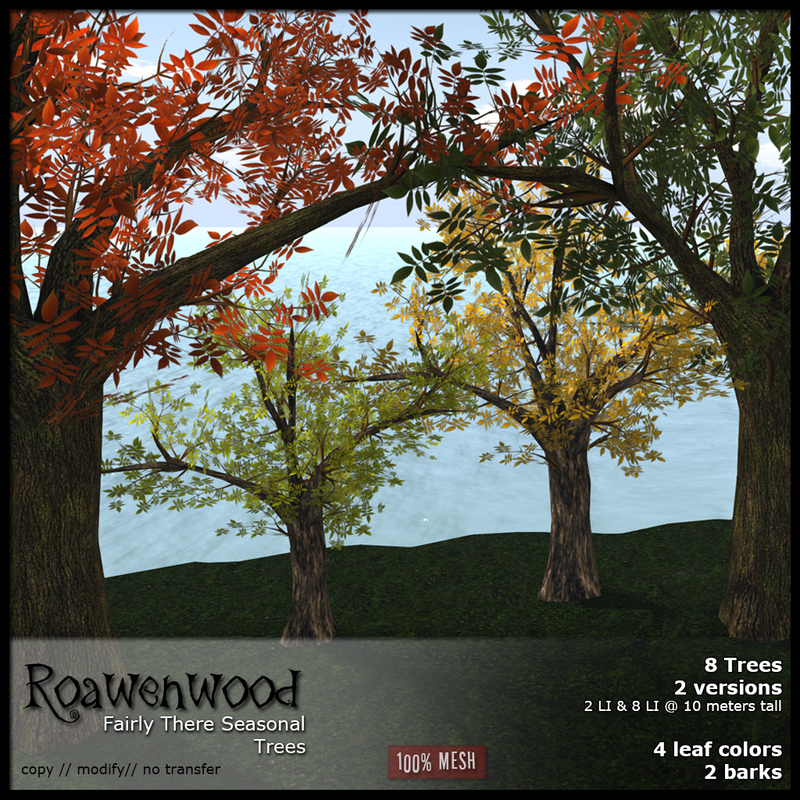 I think I’ve been wanting to just sit beneath a set of trees breathing in the moments plus I have been creating my space in SL to sort of share and that always has a rather woodsy element. In that vein I have a few sets of trees and some butterfly tracks. 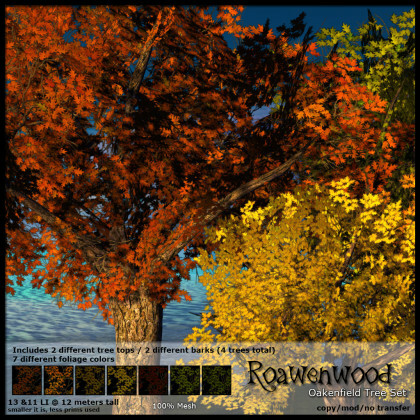 For We<3 RP this month at a discount are two sets of trees. The Fairly There Fantasy Set and then the Fairly There Seasonal set. They are titled that because at the time of creating them I felt like I was… fairly there with finishing a display. *laughs* Never ask a creator where they come up with names by the way, sometimes we’re kind of warped or just come up with something……….. odd. I like these a lot. Both sets really for different reasons. The fantasy trees obviously have some wilder colors to them, I have become quite taken with the lilac one, it feels light… springy. I like the other ones too of course but that one is probably my favorite in the set. 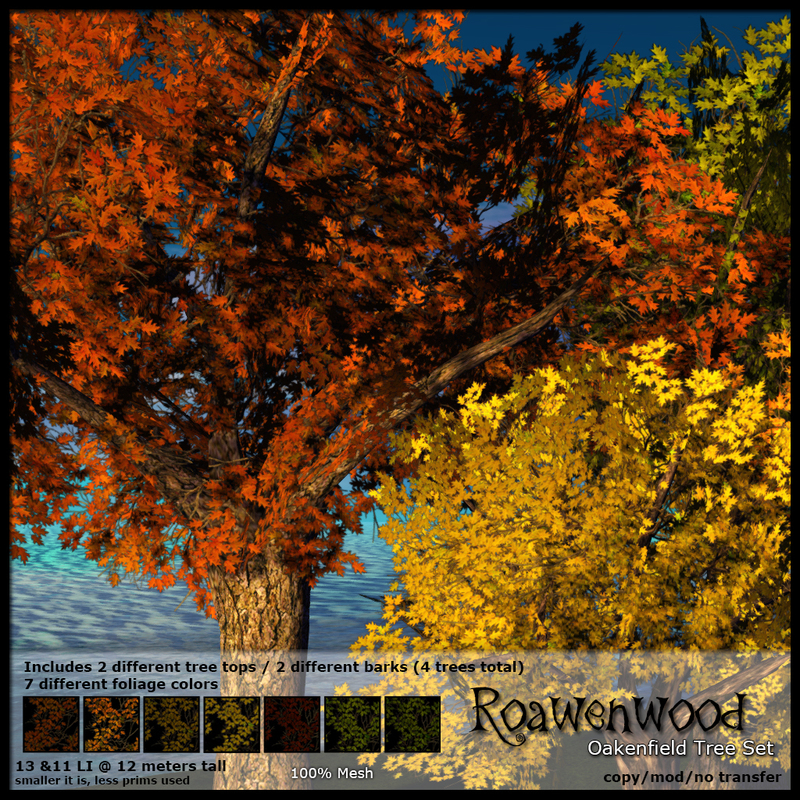 Then the seasonal trees have some more normal bark to them along with the coloring of the leaves from deep green to some colors that will look wonderful for autumn scenes. Another item that I fell in love with ages ago are butterflies. I like creating levels of color and movement within my displays, builds or areas so having little butterflies darting in and out among the grasses or in general around the trees can be somewhat soothing for me. Light and playful elements. So I decided to spend a little time trying to make my own. I have these set up be rather awesome I think. 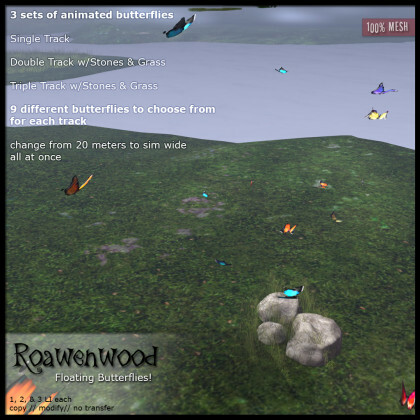 There’s something like 9 different butterfly textures for each track, various colors and a few different patterns for the wings letting you pick what you like. And while I did all that I set it up so you can rezz 1, 2 or 3 tracks at a time. The sets with 2 or 3 tracks have an anchor. A set of stones with grass around it so you can easily move them. Each track can have their textures changed so you can have all the same on one set or 2 or three different ones. However you want to play it. To add to the versatility I have it set up so you can change the butterflies either right in front of you at 20 meters, then up to 100, then if you really want to do it all at once sim wide. Everything at the We <3 RP event is at a discount of 25% so they’re cheaper than normal… go get em if you want em. 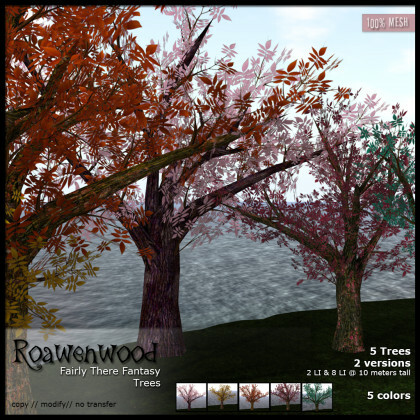 The last thing that I can mention here is a set of trees that I released for the Cosmopolitan event. For the two week round I had a set of oak trees that I fiddled with. They weigh in a bit more than I’d like to be honest on the Land Impact but that does happen on occasion. The trees have I think 7 different textures for the foliage and two different barks. This gives a lot of options with the look. They are on sale there until the 12th and then will be added to store inventory. I WILL update for Twisted Hunt soon… I have plans hopefully coming up that will add to it so maybe I’ll do it all at once. Posted in: Fantasy, Furniture, Landscaping & Prefabs, Seasonal, The Liaison Collaborative, We <3 RP!